2. Simmer the mix for 2 minutes and then pour straight over the pork. Tightly wrap the baking dish in tin foil and place in the oven for 2 hours. 3. Meanwhile, prepare the accompaniments: finely shred the white parts of the salad onion lengthways, deseed and cut the cucumber into batons and finely slice the red chillies. 4. When the pork is cooked through (with no pink meat) remove from the oven. Turn the pork over in the liquid and allow to cool, covered, until cooled enough to handle. Then remove from the liquid, cut off the layer of rind from the top, slice the meat into ½ cm thick pieces and place on a serving platter. 5. 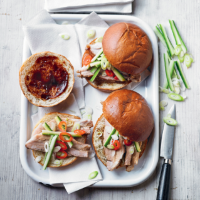 Serve the pork in the buns with the hoisin sauce, accompaniments and a little of the reserved cooking liquor (optional).